What is “Equity Value Difference”? If you win the hand, you’ll win $20. You’ll have exceeded your equity in the pot by $20 – $6.42 = $13.58. Your Equity Value Difference is -$13.58. If you lose the hand, you’ll be $6.42 below your equity in the pot. Your Equity Value Difference is $6.42. Remember this: when you lose an all-in hand, you’ll have a positive equity value difference. 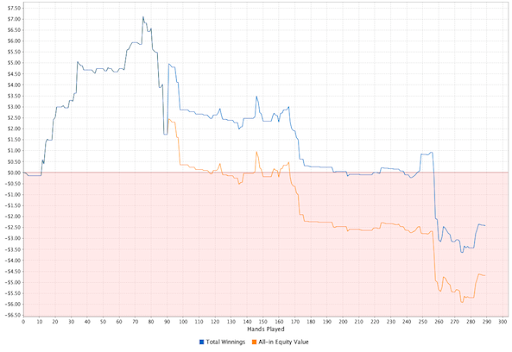 When you win an all-in hand and exceed pot equity, you’ll have a negative equity value difference. The exceptions are when you had 0% equity or 100% equity, in which case your equity value difference will be zero. How do I read the “All-in Equity” chart? In the short run, the “All-in Equity” chart is a crude measure of luck. Did you have some bad luck in the current session? Then your “Total Winnings” will be below your “All-in Equity Value” line. Did you get some lucky breaks? 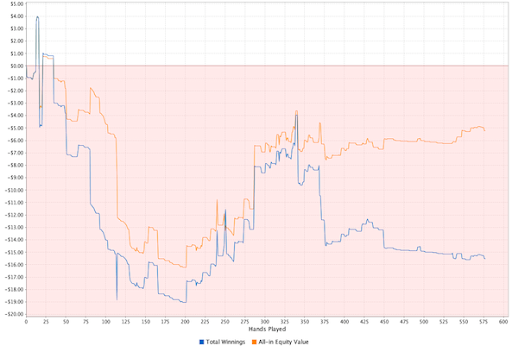 Then the “Total Winnings” line will be above the “All-in Equity Value” line. In the long run, the “All-in Equity” chart is a measure of how good your reads are when going all-in. If, in the long run, you mostly go all-in when you have favourable equity, then your “Total Winnings” line will be above your “All-in Equity Value” line. You are tending to correctly guess what ranges of cards your opponents have, and are making all-in bets and calls wisely, based on those guesses. If, in the long run, you mostly go all-in when you have unfavourable equity, then your “Total Winnings” line will be below your “All-in Equity Value” line. You need to be more selective in going all-in.